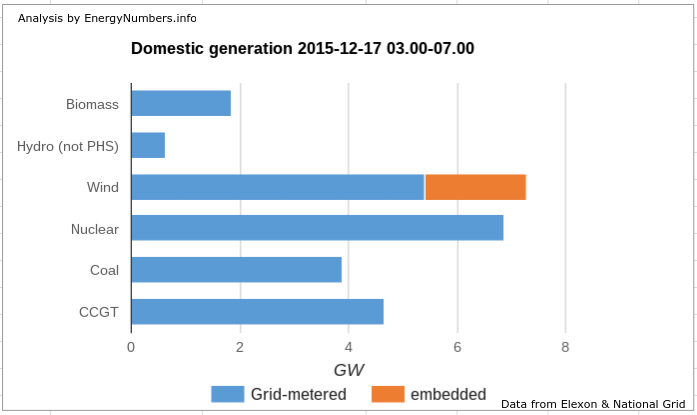 On 17 December 2015 Britain passed a new landmark on the road to cleaner electricity: for four hours, from 03.00 to 07.00, the grid had a plurality of wind: wind was the largest generation type on the grid: there was more wind generation than generation in Britain from gas, or from coal, or from nuclear, or any other domestic source. That was the case for the four hours as a whole, and for each half-hour within that four-hour period. Within that time, wind generation varied between 7.0 GW and 7.5 GW, with 5.2-5.6 GW of that coming from larger transmission-grid-connected windfarms, and 1.8-2.0 GW coming from embedded wind generation. What does the capacity factor of wind mean? Photovoltaics in Germany: has solar power been worth it?